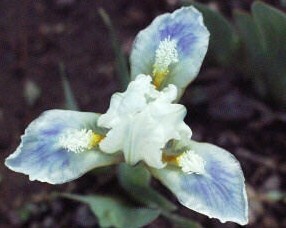 'Tiny Temptress' (Anthony and Dorothy Willott, R. 1998). Seedling #W 94-50. MDB, 4-5" (11-12 cm). Early midseason bloom. Standards warm white; style arms white; falls blue white, blue flush at end of creamy white beard; lightly ruffled. 'Little Drummer Boy' sibling. Willott 1998.